The Alvita Absorbent pants are a convenient and discreet solution to moderate to heavy incontinence in people who are mobile. Super absorbing layers rapidly trap fluid to prevent wetness and leakage, while the products’ ultra-soft c...over helps keep moisture away from the skin, ensuring comfort and dryness. The soft elasticated waist ensures a tight but comfortable fit. A body shaped core pad and elasticated leg cuffs ensure a close and comfortable fit as well as further protection against leakage. The pants include an odour neutralizer, ensuring freshness and confidence throughout the day and are latex free. A securing tape is included to roll the product up for easy disposal and a wetness indicator helps to show when the pants should be changed. Two sizes are available for each absorbency level: medium (to fit waist size 80-110cm); and large (to fit waist size 100-135cm.) There are two levels of absorbency, Super and Maxi which can absorb up to 1430ml and 2090ml of fluid respectively. 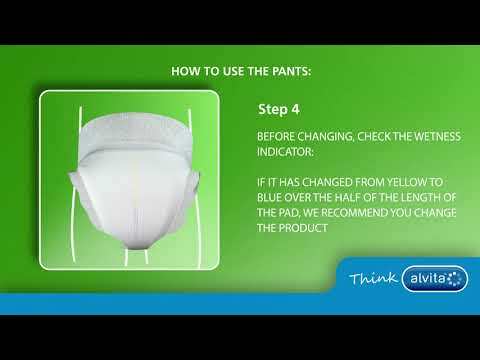 For full information about the Absorbent Pants, see the video tutorials. Comfortable product includes a soft, elasticated waist and leg cuffs.